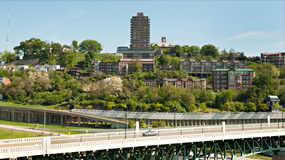 With amazing views of the riverfront and downtown Cincinnati, the Edge is conveniently located steps away from Sawyer Point and the Purple People Bridge, with direct access to Fifth Street and downtown CBD. The Edge was renovated from start to finish with energy efficiencies in mind for low impact on our tenants and the environment. By using less energy, the Edge is able to save money for tenants and taxpayers, reduce greenhouse emissions, and contribute to a healthier environment for the community. With floor to ceiling glass windows, incredible views, natural sunlight, and customizable floor plans, each space in the Edge is customized to fit our tenants’ unique needs and styles. The Edge is a commercial loft office space located in downtown Cincinnati just steps away from Sawyer Point and the Purple People Bridge along the river. With its convenient downtown location, biking or walking to local restaurants, art museums, the stadium, hotels, and more is quick and easy. Built in 1936 by America Publishing Company for storage, the Edge’s all-concrete building consists of five floors and 100,000 square feet. Converted by Campus Management in 2010, the Edge now hosts a variety ofcreative and unique tenants who enjoy the floor-to-ceiling-glass, environmental efficiency, and convenience of the Edge space. Each tenant works with our designers and architects to build customized spaces to fit their business’ needs – learn more about each one of them here. Parking: Garage and surface parking available. Free visitor parking. Purple People Bridge. Direct access to Fifth Street Via Staircase East of Procter & Gamble, and Downtown CBD. 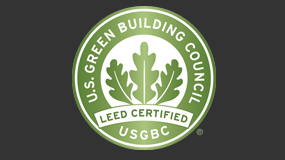 Perks: LEED Certification means lower utilities and more efficient energy and water use. Real Estate Tax Abatement is available for 12 years. Copyright © 2014. The Edge. All Rights Reserved.